1 bedroom apartment (45 square meters) with double bed, sofa bed and extra kitchen. This bright apartment can accommodate 4 persons. The spacious sleeping area is visually separated from the living area. The apartment is quiet to the backyard. The property is just 3 minutes from the central railway station, right in the center and in life. In 5 minutes walk Nearby are the railway station, the nightlife district of St. Georg, the Alster and the major shopping streets of downtown. A great place to stay ! Generally good facilities, equipment and ambience. Only complaint - In main room only 1 of 6 lights worked properly and it took two days for 2 to be fixed, still leaving 3 non-functional ! This cozy little old building is located in the city. The starting point for its shopping areas, such as Jungfernstieg and Mönckebergstraße. The Kunsthalle, other museums and the Alster are within walking distance. 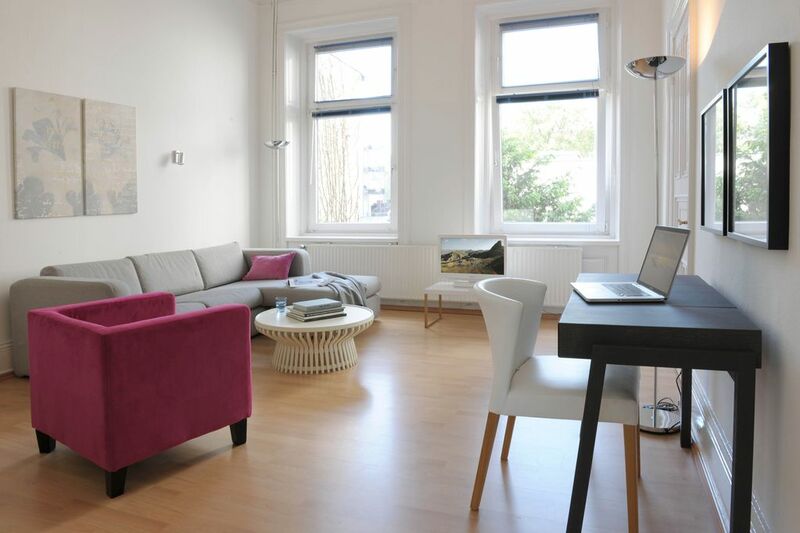 The apartment is located in close proximity to the central station, this is the perfect location to explore Hamburg. Bars and restaurants are just around the corner. Not far from the apartments and the long series begins - a popular street in the trendy St. Georg. Here you will find a variety of cozy restaurants, cafes and bars, which offer many opportunities on sunny days to sit outside.